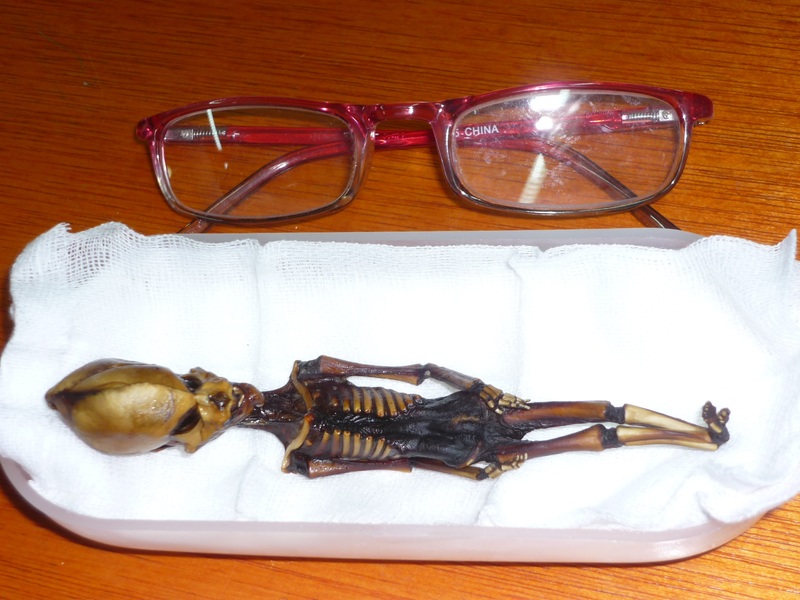 You may (or probably may not) remember back in 2013 I got annoyed by the sensationalist reporting around some diminutive human remains found in the Atacama desert which were hyped by some to be evidence of alien life, and by others as an example of an extreme form of dwarfism. The apparent age of the individual was suggested to be 8 years based on bone density and fusion as assessed by a paediatrician. In light of this I wrote an analysis of the specimen pointing out that in the features suggested it was a human foetus, probably aborted, exhibiting features altered by taphonomic processes (things that happen between death, burial and discovery) that apparently increased bone density and appearance of fusion, as has been noted in an infant Egyptian mummy, where bone fusion suggested an age between 7 and 10 years, but the height and dentition suggested an age between 14 months and two years (huge thanks to rlabanti for tracking down this archived copy of the paper, as I forgot the reference and the old link died). Aliens aside, the authors of the initial study have been doing more work and have come to the conclusion that the specimen represents a preterm infant with an interesting suite of genetic anomalies that may account for the features seen. I’ve seen the paper and the genetic analysis looks pretty reasonable (at least as far as I am able to assess), but there is still a gaping hole in the taphonomic analysis – in that there is none. I still consider this to be a problem, because you can’t understand phenotypic (what an individual looks like) abnormalities using genetics in isolation, especially when you know without doubt that there have been post mortem processes taking place. However, as interpretation of the specimen has become less sensational, I find myself less concerned by the omission – although it remains significant. We now know from the new analysis that the Ata foetus was female and had a genetic profile suggesting some input from a variety of geographical locations, but with a predominantly Chilean genome. This information humanises Ata and changes the tone of the discussion. Rather than my suggestion of deliberate abortion – which was based on an initial mistake regarding damage to the skull which was post mortem rather than a cause of death – it’s more likely that the mutations cited as likely causes of genetic disorders contributed to spontaneous abortion (miscarriage). This is a deeply distressing, yet unfortunately common situation when there are developmental issues with a foetus. On a human level, it means that someone lost their child – and that deserves a bit of respect and sensitivity. Cripes. I went back to your first post and have read some of the comments. It really does make you wonder how humanity manages to survive.